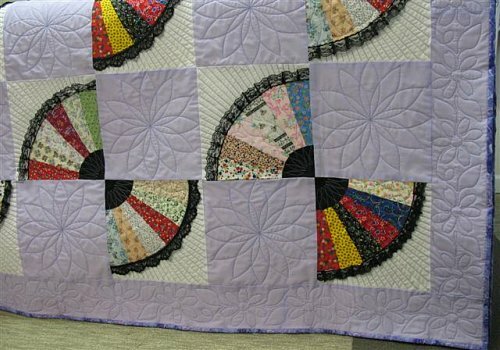 Longarm quilting patterns are used when quilting by hand, and by those who use longarm quilting machines. …are you kidding me; the same kind that I use to make my dresses? I had to experience this longarm as they were calling it. I even had to verify what they were calling a 16 to 18 inch throat. The extra few inches were necessary to accommodate the bulk of your quilt. To make things worst my 5/8-inch seams when I sewed a blouse had perfect tension for a perfect stitch. No pulling or shoving was necessary because there was a set of “feed dogs” located right under the presser foot. Now they want me to lower the feed dogs on the machine and float the quilt with my hands as if to be coming down from a high, the stitches looked like it too! I have to tell you oh that I have never been on a high! No doubt about it, it beats the long grueling hours and hours of hand quilting and a fast way to reduce that closet full of un-quilted quilts. There is a bit of a learning curve in using the longarm and it is a bit tricky to master. Plus you have to be willing to defend your pricing, if necessary, for your time and artistic talents. 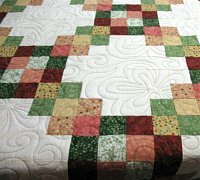 Most quilters are willing to give up a few green backs for a quilted quilt if not before then immediately after they try the longarm for the first time. Learning Free Motion Quilting the Easy Way! The best solution for Free Motion Quilting is Practice! Practice! Practice! After getting the feel of drawing teardrops on my dry erase board I was ready for the Big Guys...I was amazed of how easy it was once I actually tried quilting on my Long-arm Quilting Machine using practice fabric. BTY, these practice quilts make wonderful blankets for the puppies at your local humane society for small critters...Your neighborhood pets will love you. If you don't have a longarm frame you may want to learn how to load the old fashion 2-Rail Roller Frame. We have a Free 2-Rail Roller Frame mini book that shows you how. 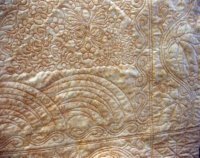 No matter, if you are a hand quilter or a machine quilter or one that will seek a professional to quilt your tops, you have to decide on a longarm quilting pattern that will compliment the top. At first this can be one of the tougher decisions in making a quilt. There are hundreds of Great Books on learning 'How To'...here are just a few I have at my side all the time when I am relaxing and just doodling! 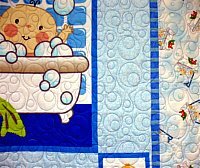 You may want to consider a professional quilter that has lots of patterns to choose from. 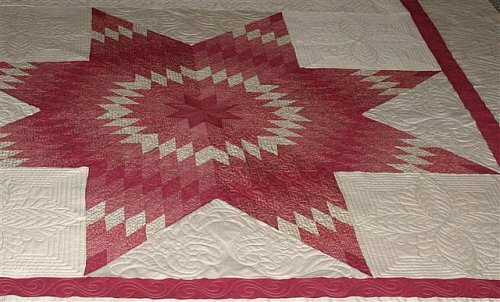 Ask for recommendations and maybe even look at a quilt that has been completed using a longarm quilting pattern. As one that quilts for others, (DBA Quilting by ab) when I’m asked to make a professional decision, I get excited because this allows me to express some really great work using longarm quilting patterns, machine quilting patterns, or continuous line quilting patterns. 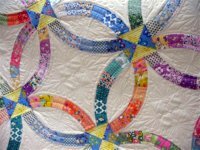 Let me share a few more secrets when choosing a longarm quilting pattern! To get started, I hang the quilt on my Design Wall, study the top and think about what attributes the top and quilting pattern have in common. Most of the time a quilting pattern will just POP in an hour, in a few days; in a week; but, POP, it will. I am patient; I don't like to rush this process. Other times I will walk past it and shazam! I wonder why I didn’t see it earlier. If this happens, capture the moment. Stressing is the wrong thing to do. 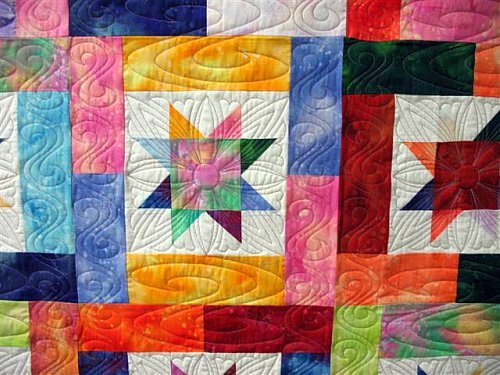 The right quilting idea simply happens for those of us that have a love for quilting! You will get to this point too. Feel free to contact us by using the Contact Us page. 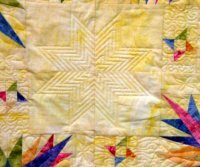 Here, take a look at a few longarm quilting patterns that was quilted by Alice, (DBA Quilting by ab). Click on any image to enlarge the view. This quilt was a paper pieced quilt top of different shape stars. I actually made this quilt twice for customers and quilted it 3 different times for for other customers. 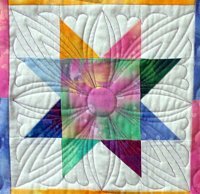 I did custom quilting and the people loved the fill stars I used in some of the blocks. Stitching samplers are always nice to keep for a reference, for "show and tell" as well as a display for those that need to visualize a design. I had some fun stitching this piece with various trees, leaf patterns, circles, and stippling designs. The lady that created this top did a beautiful job of cross-stitching and wanted me to sew the blocks into a quilt top. I sewed sashing around each block and added a border. 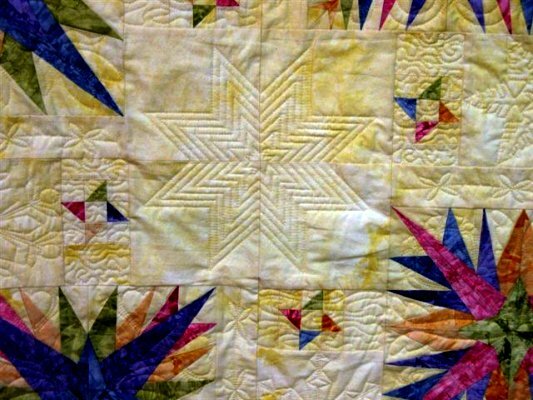 The quilting only required a circle design around each print to secure and a fancy leaf design in the sashing. This quilt was like a strip quilt and needed something special to separate the strips. I alternated the Baptist fan and a butterfly nested with stippling on every over row. The borders show a very large leaf pattern with a small scroll design in the sashing. 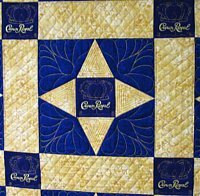 This 'Crown Royal' quilt was made from a collection of CR bags. Neat, don't you think! 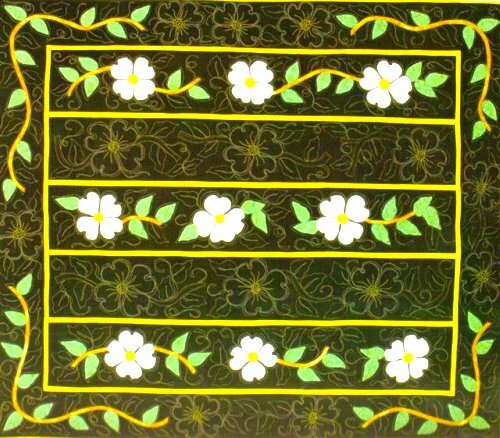 A simple cross-hatching stitch was used in the borders and feather designs in the center block. If you look close, you will see my own digitized crown above the words “Crown Royal” in the 4" x 4" squares. Here the top was appliqued with flowers and spaced with plain blocks between. I did a stipple design around each of the appliqued flowers after outlining them. This is always fun because you can be very creative in the plain blocks. 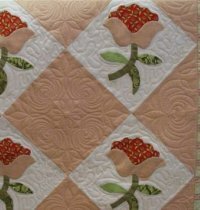 Here I used a complimentary flower as my machine quilting designs. The Double Wedding Ring is an old time favorite design that is not only a challenge but very pretty using 30's materials. 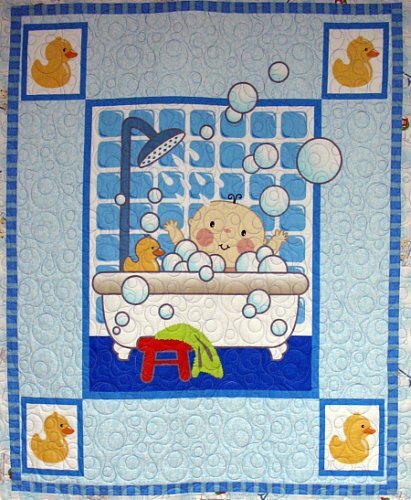 This quilt was pieced using Quiltsmart templates by Mattie Rhoades. 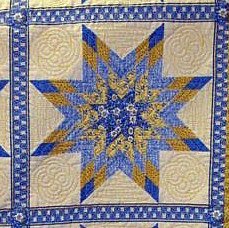 The machine quilting designs was one of Ellen Munnich's @ Quilt Recipes. 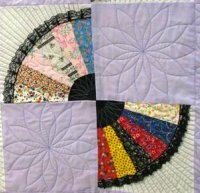 Here we see the traditional Dresden Plate alternated with plain blocks which allows some creative quilting by the quilter. 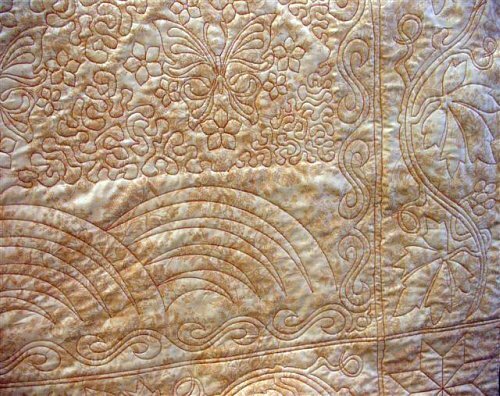 The Dresden Plate is filled with stitching and Sunrays on the outside circle with a large flower in the plain blocks. 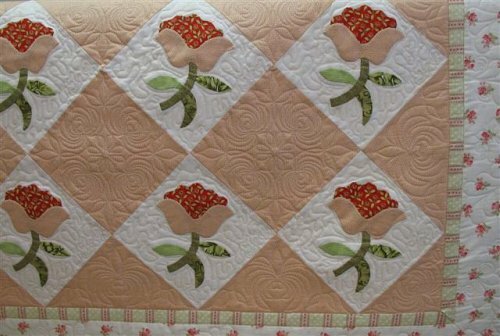 Just look at what an inexpensive quilting design can do for a beautifully pieced quilt. 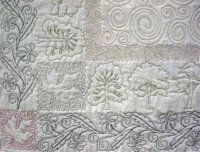 This is a large free flowing edge-to-edge jumbo design that adds a lot of interest to the open white space in the quilt. This is a practice quilt. You have to look hard to realize it is a stamped piece of material. I used a feather border with a single row of crosshatching in the sashing, Celtic knots in the corners of the star block, fill lines in the spaces between star points and a fill star pattern in the large stars. 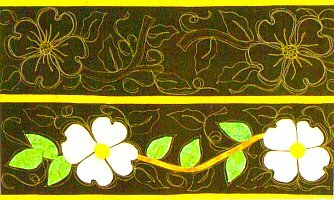 Here is an beautifully appliqued quilt of white dogwoods on a black background trimmed out in yellow. Click on the image to see the beautiful front in full view! I choose a row of dogwoods in the plain strips and quilted around the appliqued leaves and white flowers in the borders. Here is another favorite, "The Lone Star". 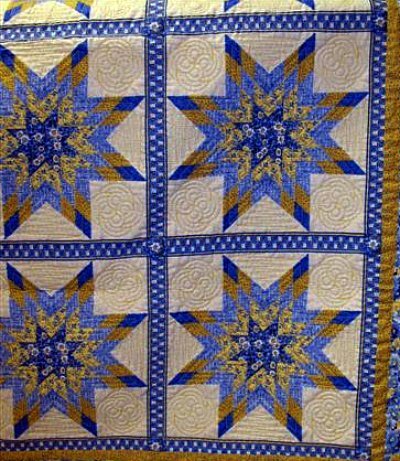 This quilt had a very pleasing look with a row of stars across the top of the quilt. This quilt was done using a design from Digi Tech. The feathers always add a special touch to any top. This quilt was pieced by my dear friends' granddaughter and have to say she did a beautiful job of piecing and coordinating colors. She was very proud and thrilled with the finished results. 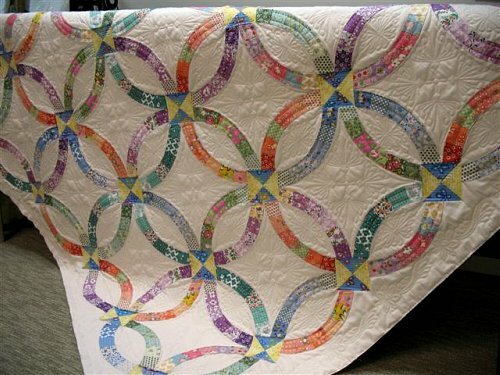 I used varigated tread with swirls and squiggles in the sashing and a special square flower design in the star square . 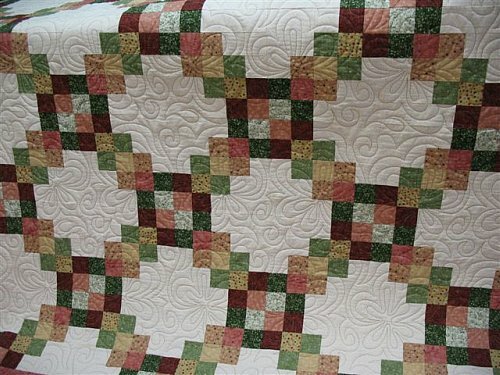 Pantograph or edge-to-edge quilting: A design quilted from one edge of the quilt to the other, and then repeated is edge-to-edge quilting. A pantograph is often used in borders. 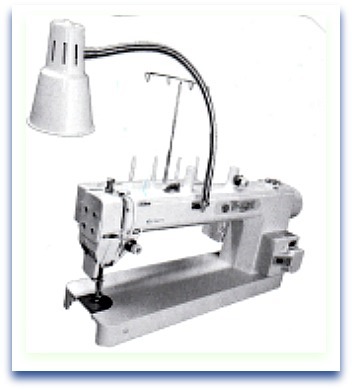 Pantograph quilting is generally less expensive than custom quilting. Custom (or free hand) quilting: This is any design not quilted edge-to-edge. The designs are more intricate and emphasize particular elements such as blocks, section, or borders. 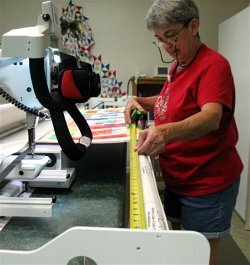 Due to more extensive planning and longarm machine set-up, custom quilting using a longarm quilting pattern is more expensive. 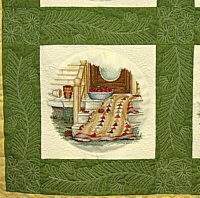 Many quilters will also use a combination of styles, such as a pantograph on the interior, with a custom design on the border or vice verse. 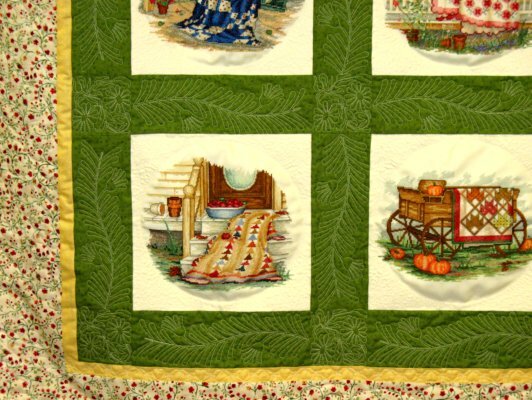 Heirloom quilting: Heirloom quilting is a more dense and detailed version of custom quilting. 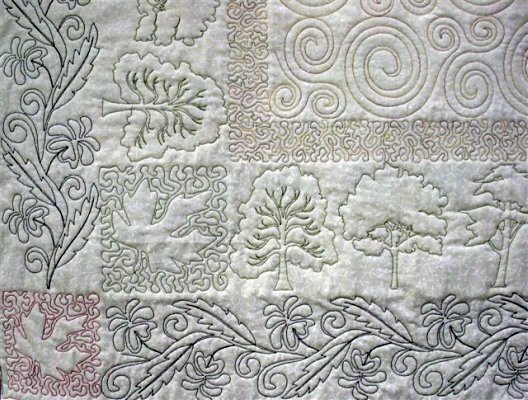 Free hand quilted designs, small stippling, echo quilting, intricate feathers, grids and cross hatching, and multiple quilting designs on one top are typical of heirloom quilting. 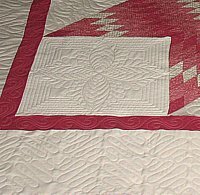 I offer longarm quilting patterns (DBA Quilting by ab); using my Handi Quilter and PCQuilter computer quilting ...I am able to handle any size top up to a king-size bedspread. I strive to do quality work and treat each quilt top with up-most care. Please feel free to use our Contact Us page for additional questions. I also offer piecing of tops for a flat charge depending on the detail of pattern or by the hour. Pricing is based on the size of your top and the amount of detail required. Prices are calculated by the square inch - length X width X price per square inch. Want to see just how an expert operator of a Gammill-Statler Stitcher produces edge to edge custom quilting? Kimberly Burke has this skill mastered. Visit Golden Needle Quilting. 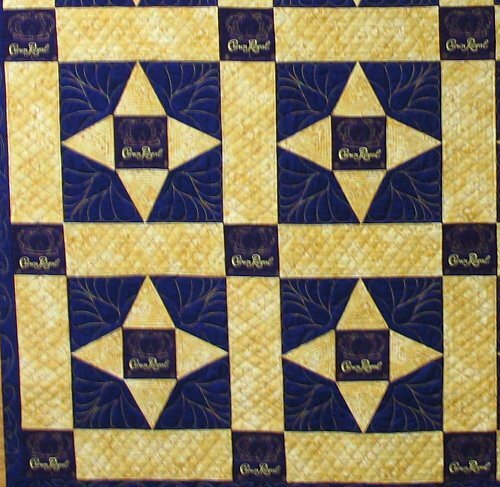 This is one of many Crown Royal quilts we have made...No, we don't indulge...We buy our Crown Royal bags from E-Bay! Judy from Tennessee says "I really enjoyed viewing your site and learned so much! Will definitely return to learn more. Freda here, WOW! your site is a pleasure to browse through. Great tips...Keep them coming! Just wanted to thank you for the wonderful review and recommendation of our Universal Thread Holder and 'Easy Winder' bobbin winder. It is sew nice to be accepted and acknowledged by the Pro's in this industry. Love the patterns, thank you so much! Go ahead and click on him!